Our popular mid-size trowel for the professional finisher. Reliability and performance are trademarks of this industry proven trowel. 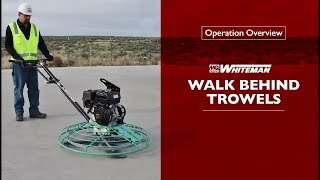 Watch this video to learn more about operating and maintaining your MQ Whiteman Walk Behind Power Trowel, including important safety guidelines, a pre-operation checklist, and operating tips.